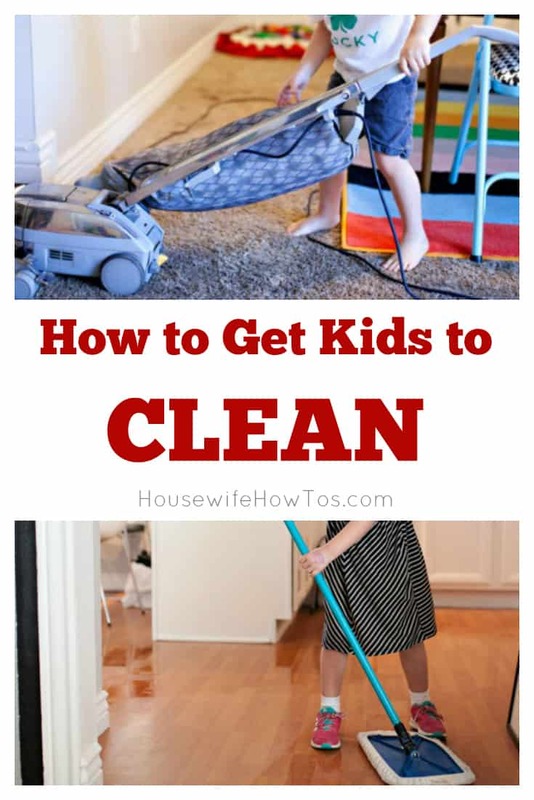 At least once a week I receive an email asking how to get kids to clean. Not surprisingly, the frequency of such emails spikes during summer vacation — today alone I got four. Four! The emails range in tone from exasperated to downright furious, but they all have one thing in common: a distraught parent who feels taken for granted by mess-making offspring, and who knows deep-down that’s just not right. Now, let me first acknowledge something: I am not a parenting expert. I don’t have a degree in child psychology, nor do I consider myself a parental role model. I have two kids (one who just graduated college, one who will start high school in the fall) who are both natural slobs BUT who’ve learned to clean up after themselves. My oldest child now keeps her apartment clean and lovely, though when she was still living at home she’d have happily wallowed in filth if I’d let her. My youngest is at the stage where he’d rather wallow, too, but he’s coming out of it. Both kids have had cleaning chores since they were able to walk, and both know they’re expected to help around the house. Judging by my daughter’s turnaround once she started living on her own, I have high hopes for my son when he reaches that stage. And it’s all because I taught my kids how to clean. So for those of you tired of feeling like an unpaid maid, who’ve spent far too many Saturdays cleaning while your kids relax or play video games, and who are starting to think about shipping the little darlings off to boarding school where they can be someone else’s problem, here’s my best advice. I can tell you from first-hand experience, screaming will not get your kids to clean. Neither will spending your Saturday morning gathering up the mess they’ve left all over the house and dumping it on them in their bed while they sleep late. Yes, I’ve tried both approaches (see the previous disclaimer about not being a parental role model), and it did nothing but make me feel great for 30 seconds then crappy for weeks. What works: Try first to get your spouse on board, because a united front is essential when dealing with household changes. Even if your spouse just shrugs and says “whatever,” at least they know you intend to make some changes. Next, sit down with the kids and explain that it’s every family member’s responsibility to help keep the home clean. Just as they like to relax and enjoy free-time, so would you and you’ll have more free time to do things with them you aren’t doing so much of the housework yourself. 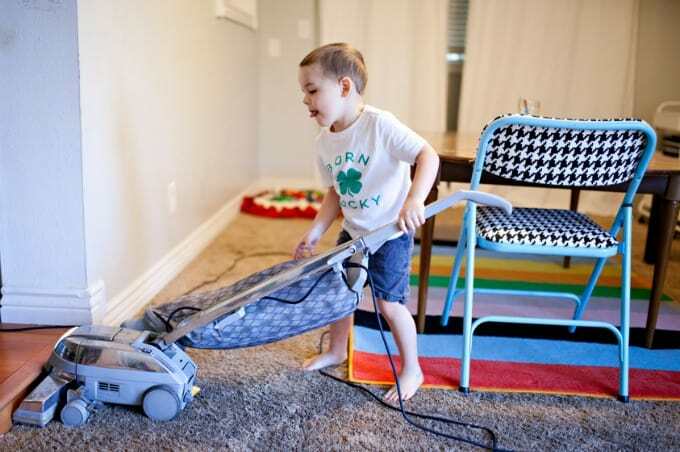 When you’re exasperated, it’s tempting to point to a filthy family room and tell your kids “Clean this mess!” Unfortunately, that approach dooms your kids to failure. Think about it: if it was your first day at a new job and your boss expected you to do everything correctly without training wouldn’t you be overwhelmed (and probably think your boss was an idiot)? 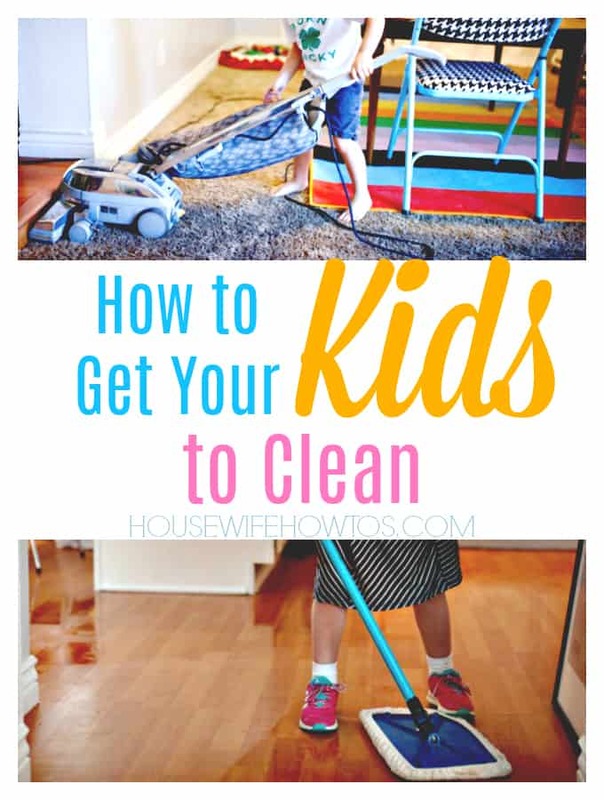 What works: Ideally, kids learn to clean from a very young age. How young? Well, right about the time they’re in the way when you’re trying to clean is a great time to start. Have them do one of the chores kids can do while you tackle more significant projects in the same room. When they’re old enough to work unsupervised, have them spend ten or fifteen minutes doing one-minute chores every day. Telling your kid “Go clean your room” seldom works. Oh, sure, they’ll disappear for a while, but you’ll probably find they’ve been playing. My son once spent four hours supposedly “cleaning” his room, and every time he popped out for a glass of water or a snack he’d assure me he was busy cleaning. After a loud crash, I barged in to find his closet door had come off and landed halfway across his room, narrowly missing him. It turns out, he’d shoved everything into that tiny closet — so much stuff that his closet had exploded with junk! What works: If you’ve got the time, by all means, sit down and write out a step-by-step list of how you want a room cleaned. Not just “dust the family room” but “dust the picture frames, then the shelves, then the stuff on the tables AND the tables.” Or save yourself some agony and print one of my cleaning checklists. There’s even an exclusive kid-friendly bedroom cleaning checklist to avoid closet explosions. You know why kids on TV cheerfully stop playing video games and do chores when their parents tell them? Because it’s in the script. In real life, kids complain. They sigh. Loudly. They roll their eyes, whine, and come up with a million excuses. The more bull-headed ones will flat-out refuse. Too often, parents deal with such things in one of two ways: they get mad and start screaming, or they give up. Neither response motivates kids to clean — as you may have figured out by now. Remember that boss I mentioned above, the one who hypothetically told you to do a job without training? Imagine she took some time that first day to show you how to do your work. You’d feel a bit less nervous about it, right? But what if she scolded you for not performing as well as a more experienced employee? Or for quickly AND correctly, too. How excited would you be to go to work the next day? Don’t be that boss! Kids do not have the mental faculties to see a clean house as a reward in itself. Nor do they feel that pride in a job well done is its own reward, no matter what those 1950s TV shows might say. Praise may motivate them, but in this era when kids get MVP trophies just for participating in a no-score soccer game, recognition isn’t the valuable currency it used to be, either. What works: Whether to give kids allowance money is a choice parents must make for themselves. We’ve always given our kids “allowances with a catch” — they get a minimal, set amount every week regardless of whether they help out and a more generous amount if they do their chores. They’re expected to use their allowances to pay for things like going to the movies with friends, video games, etc. We buy their basics (clothes, food, the cost of treats or admission to things when we go as a family) but we expect our kids to work for luxuries. We also expect them to work for privileges like screen time. Is that mean? My kids have said as much until I pointed out that their father and I have to do our work to keep the electricity running so they can enjoy such things, so shouldn’t they have to do some work to use it for leisure activities? Sure, they complained at first and, following my own advice, I ignored the complaints. Then I turned on our wifi router’s parental controls to keep them from accessing the internet until their chores were done. Now my son does his tasks when he wakes up — without complaint. FOLLOW THROUGH. FOLLOW THROUGH. FOLLOW THROUGH. Chances are you’ve tried a number of approaches: chore charts, spinning wheels, lottery-style drawings of paper slips with chores written on them, whatever. Chances are it worked for a while and then something happened to derail it all. Maybe someone got sick. Maybe schedules changed. Maybe you went on vacation, came home, and never got back into the routine. Now you’re fed up and worry you’ll get started on a new routine only to have it fail again. Guess what? Your kids feel the same way! Their complaints are only going to get louder and longer when you announce you’re going to start a new cleaning plan that involves everyone because, as I mentioned, they’re hard-wired to test if this time you really mean it. What works: YOU have to be the example. Acknowledge that things got derailed and that it’s time to get them back on track. Do YOUR work, and assign your kids chores following the advice above. Start small. Demonstrate. Adjust your expectations. Enact consequences. Give rewards — and don’t forget that family fun time is a great motivator. Most of all: stick with it, because you can’t honestly expect your kids to be self-motivated and diligent if you aren’t.